When thinking of Valentine’s Day, we often think of a heart-shaped box containing sinfully delicious chocolate truffles, or chocolate filled with caramel, or other delectable. While it tastes good on the lips, it’s not good for the hips – even for children. According to the Center for Disease Control, currently 16 percent of children are obese. Studies show that early weight problems can lead to diabetes and heart disease, even in childhood. Pink Heart Shake. 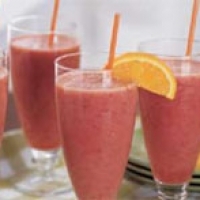 Blend raspberries, strawberries, mangos, spring water and ice, along with stevia or a drop of honey to sweeten. Serve the shake in individual portions in decorated paper cups, and embellish each portion with cocktail umbrellas for a special touch. Fruit Kabobs with Yogurt Dip. Load red or pink plastic skewers with strawberries, cherries, watermelon and red seedless grapes. Use a tiny heart-shaped cookie cutter to shape the watermelon, to add to the festive look. Low-fat vanilla yogurt works well as a dip, and strawberry yogurt makes a perfect a Valentine’s Day theme. Chocolate Fondue with Fruit. Melt 1½ cups of semisweet chocolate chips in the microwave or in a double-boiler (use dark chocolate – it helps blood vessels relax, to lower blood pressure, and has heart-protective antioxidants). Add 3 tablespoons of sour cream and stir until smooth. Prepare fruity treats such as fresh strawberries, banana chunks, apple slices, orange slices, or fresh or canned pineapple. Using a fork, dip the fruit into warm chocolate and eat immediately, or dip and freeze for later (to freeze, place the fruit on wax paper on a cookie sheet). A hug, a tickle, a favorite meal – there are countless ways to express your love for your child. Yet perhaps one of the best ways to say “I love you” is to teach your child how to save for the future. But where do you begin? When there’s a special occasion, have your little ones empty their piggy-bank booty and look for items within their price range. Give them the option to buy something or to continue saving their money – you just may be surprised at their response. Give your children an allowance. Be sure they understand that all of their chores must be done each week in order to receive their allowance. Take them to the bank to open a savings account and, just as when they were younger, get them to agree to save about one third of the money they receive as gifts, allowance or earnings. 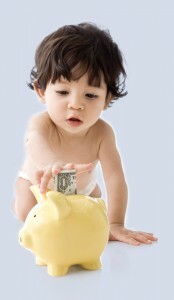 To jump-start their savings, start them off with, a small amount of money. Spend time teaching them how to track their money in a savings deposit passbook (or online), and explain how their money grows by earning interest. Match whatever amount they save – it’s a fast-track way to save for children of any age. Watch how fast they’ll catch on to saving! Of course, it’s up to you to set ground rules for their savings account – such as “saving for a rainy day” or “not to touch for ten years” or “saving for a particular item” – maybe a tech product or a new pair of shoes. Several years ago, a money expert crunched the numbers and found that a 15-year-old could become a millionaire by retirement age simply by investing $2,000 every year for a period of seven years. That’s certainly an incentive for a “not to touch” status for the savings account. The Grow-Up Plan is a whole life insurance policy that protects your child while starting a nest egg for the future. The Plan accumulates cash value as long as premiums are paid. After 25 years, the policy’s cash value will be at least equal to or greater than 100% of premiums paid. The Gerber Life College Plan guarantees payment of the full benefit amount at maturity for college or any purpose, as long as premiums are paid. With so many ways to express your love, a lesson in good financial habits is something that your children will cherish for years to come.